The centenary of the First World War has inspired a large number of books on the campaigns and armies of the conflict. However, very few cover the early campaigns between the Austro-Hungarian and Serbian forces, and fewer still cover the Serbian army in any detail. This is just one reason why Dusan Babac's book is so welcome. The author starts with a decent overview of the main campaigns. If you are looking just for a narrative history of the campaigns, then Andrej Mitrovic, 'Serbia's Great War, is probably the best option. What Babac gives the reader is a much better understanding of the Serbian army - its preparedness for war, organisation and equipment. The real strength of this book are the many illustrations, in fact you could almost call it an illustrated history. It is full of contemporary photographs and pictures from museum collections. Uniforms, weapons, equipment, standards and decorations are covered in detail. If there are any faults, the absence of decent maps makes it difficult for the general reader to follow the ebb and flow of the campaigns. An understanding of Serbian topography helps explain the challenges faced by the Serbian general staff in marshalling their limited resources. 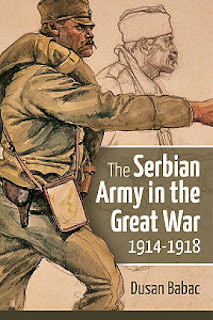 The Serbian army performed admirably and the author's patriotism oozes from the pages of this book, even if, on occasions, at the price of objectivity. However, these are minor quibbles. This is the must read study of the Serbian army of WW1 and I will be dipping into it regularly. Wargamers of this period will probably be familiar with Babac's Osprey book 'Armies of the Balkans 1914-18'. I have 15mm and 28mm Serbian armies of this period. I am the Editor of the website Balkan Military History now in its 21st year of operation, although my military history interests stretch further than the Balkans. I am a tabletop wargamer with an interest in most periods and the Secretary of Glasgow and District Wargaming Society www.gdws.co.uk.